The most important factor which determines the method you will be using to make your iced tea is the type of leaf or herb you are using. Each leaf has a very specific infusion profile, so it is important to keep this in mind when making iced tea, and especially important if you are not going to use sugar to sweeten your iced tea. 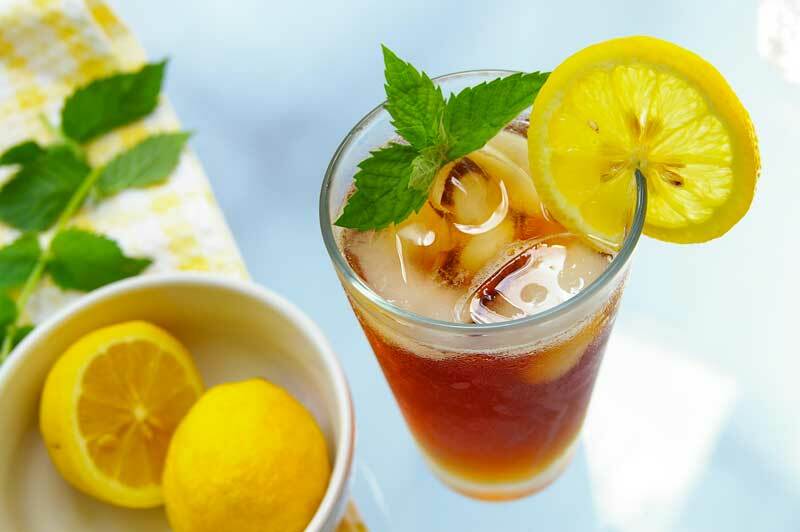 If prepared properly, iced teas are naturally sweet and refreshing, and no sugar is needed. This also makes it a lot healthier for you than store-bought juices or carbonated beverages which have added sugar. Iced teas made with white tea and white tea blends are very light and refreshing, have a naturally sweet flavor profile and a very crisp and fresh taste. White teas cannot be steeped in boiling water, or for long periods of time in warm water, as the infusion will turn bitter very fast. There are 2 recommended ways to steep white tea blends for Iced Tea. Standard Steeping Method: This is the safest method to use if you are not into experimenting. Use 1 heaped teaspoon per cup of water. So if you are making a liter, use 4 to 6 teaspoons. Bring your water to about 75C to 80C either by using a thermometer or by letting your boiling water cool for about 5 minutes. Steep the leaves for about 2 to 2.5 min, no longer. Immediately remove the leaves, and add ice to the infusion. Your tea is ready to serve. What this method does is simply ice a regular infusion of white tea. You can create double the amount of iced white tea by re-using your leaves for a second infusion in a slightly smaller amount of water, and then mixing the 2 infusions together. Cold-Brew Iced Tea: A cold brew is a long-infusion method. You would still use the same amount of leaves as in the previous method, however instead of using hot water for the infusion, you would use cold water and infuse the leaves for about 1 to 3 hours in the fridge, depending on the exact blend. This would yield an iced tea which tastes different than the iced tea in the Standard Steeping Method. It would have a slightly fuller flavor profile, and taste a bit crisper and cleaner, and also it would be a lighter infusion. This method would require some experimentation to get the timing right, so I would advise that you taste the iced tea every 15 mins to ensure it is on the right path. If you begin to taste some bitterness, stop the infusion immediately. You can add a small amount of sugar to this first test to bring it back into the sweet range of flavor, and for the next time make sure to knock off 5 minutes or more from the infusion time to stop it before it gets bitter. If you don’t think you will have to patience to to these measurements, then stick with the Standard Method above. Iced Teas made with green tea are best when using a Japanese Sencha style tea as a base, like our cherry sencha. The sencha lends itself quite well to the refreshing flavor profile most people seek in an iced tea. This is not to say that other green teas cannot be used. Simply put, sencha tastes quite good when iced. Like white tea above, sencha iced tea is best prepared with either the Standard Method, or the Cold-Brew Method. Oolong Iced Teas are one of my favourite iced teas I have ever tasted, especially the Citrus Punch Oolong. Oolongs are very flavorful and full-bodied teas, and even green oolongs like Iron Goddess make great iced teas. Similar to White Teas and Green Teas, oolong iced teas are best steeped with the Standard Method or the Cold-Brew Method. Timing is crucial when steeping black teas, and I would only recommend the Standard Method for making a black tea iced tea. The Cold Brew Method does work, but it is not always successful, so I would recommend that the Standard Method be used. In addition, I would recommend no more than a 2 minute infusion time, and no multiple infusions. Black tea is the type of tea used to make most traditional iced tea drinks and of course these are heavily sweetened. If you want to sweeten you tea, then by all means you can steep a strong infusion or use a cold-brew method, but to get a good tasting black tea without the use of sugar, I would strongly recommend stopping at 2 minutes for a hot infusion, then simply cooling the tea down with ice. Personally, I prefer the Black Lemonade blend for a black iced tea which is actually a mix of black tea and green rooibos. Delicious. Herbal Iced Teas are my favourite of all iced teas. Herbal iced teas are created only using herbs, rather than containing tea leaves. So they are not actually a true ‘tea’ however they are very very tasty and I would definitely recommend them to everyone who is looking for a naturally sweet and flavorful replacement to sugary juices. Although herbal iced tea can be prepared with the same methods as mentioned above, there is another way of making them which helps to yield a much strong and flavorful iced tea. The Concentrate Method: The concentrate method is simply a way of creating an iced tea concentrate, which is then diluted and served. It takes a bit more time than the standard method, but it yields a very rich and flavorful infusion. Using about 1 heaped tablespoon for every cup of water, put your water and herbs into a pot and bring to boil on a stove for about 20 to 30 minutes, stirring the herbs occasionally, like you are making a soup. With honeybush and rooibos-based blends, you can boil the mix even longer to extract all the flavor. When you are done the infusion, strain out the herbs while pouring the infusion to a heat-safe container, preferably made of metal. Glass containers can be dangerous to use as the heat may cause them to shatter. Once the herbs are strained out, add several scoops of ice to the infusion, about as much ice as there is water left in the infusion. Most if not all the ice will melt very quickly, but it will bring down the temperature of your tea very quickly and also help to lower the concentration. Pour the new mix into a jug, and top off with a bit more water. You can leave the tea as concentrated as you like, or dilute it to your taste. Chamomile-based iced teas need to be treated differently than other herbal iced teas because chamomile, like actual tea leaves, has a tendency to get bitter with prolonged steeping. I would recommend that all chamomile-based infusions be simmer for no more than 4 minutes using the Concentrate Method outlined above. Although you are free to experiment, steeping times of longer than 4 minutes tend to contribute to increased bitterness. Chamomile is a naturally sweet herb, and when steeped properly yield an infusion with is very sweet and delicious. If you find that your chamomile infusion tastes bitter, reduce your steeping time even more, or switch to the Standard Method of infusion and infuse the chamomile for no more than 3 minutes. Iced Tea Lattes are a new kind of iced tea which is growing in popularity. Commonly, iced tea lattes are made either with black tea or with Matcha. Iced Black Tea Latte: (Can also apply to other teas, but as this post is getting ot be quite long, I’ll just say that you can experiment with this.) Black tea lattes are prepared exactly as one would prepare black tea with milk. the only difference would be that you should make it a little stronger than usualy, and then drop a few ice cubes in your cup to cool it down. A nice variation to this would be to make an Iced Black Tea Latte ‘Slushie’, which would basically mean that you are using a blender to crush the ice into the drink and make a slushie out of it. Tried it both ways, delicious recipe to try out at home. Works with all black teas, so pick a favourite and give it a shot! Iced Matcha Lattes: Matcha lattes also work great as a slushie or a regular iced latte. Check out our blog post on how to make a matcha latte for full instructions, but this drink is both refreshing as well as incredibly healthy for you. Toss in some additional healthy powders and even frozen berries and you can make yourself a refreshing health shake for after workouts.